Today, I’m teaming up with Hood® Cream once again to share a recipe that everyone loves, but I have a few chef tips to make it a lot easier for these upcoming Back To School weeks! This Quick & Easy Macaroni + Cheese is drenched in the best cheese sauce ever – scroll down to see what restaurant tips I recommend that are easy to adapt into your home, to make every dinner simple and delicious. This recipe is sponsored by Hood® Cream. Back to school. Even though we don’t have kids, back to school means a world to us here on Martha’s Vineyard. It means that the season is about to finally slow down after a crazy summer of endless hours at work, cooking food for clients and guests, on our feet for 14 hours a day. So when we hear the words “back to school” and see them printed in promotional materials for stores and shops, we smile and look forward to it. Because it will be a time for us to relax – and maybe cook a little less. Which brings me to this Quick & Easy Macaroni + Cheese recipe – something you can make during the weekend and serve your family any night of the week, or a quick recipe you can whip up in 20 minutes in the morning and save for dinner. Honestly, these chef hacks I’m about to share might just change the way you cook every day – let’s do this! First let’s start by telling you that this is the mac & cheese recipe my husband makes at the restaurant, so you’re getting THE best recipe ever. Seriously, it’s so rich and creamy, and I know it’s mostly because we always use Hood® Cream at the restaurant, and no other brand. Being in New England, it’s important to us to support New England companies such as Hood® Cream. Their products have been trusted for generations and really take our dishes to the next level! That being said, this recipe also has plenty of cheese for those cheese lovers in your life. A combination of mascarpone (or cream cheese), plus parmesan and shredded Colby cheese make it so rich and creamy, you’ll want this for dinner every night! What you’ll do is make this recipe all the way and portion it into oven safe serving dishes like ramekins or small bowls. Throw them in the fridge covered and forget about them. Whenever you need a quick dinner, just sprinkle some of the parmesan panko topping and bake until bubbly – usually just 15-20 minutes depending on your dish and you’ve got lunch or dinner on the table. Have the kids make a quick salad (if they are old enough) while it bakes and back to school has never been easier! Below you can see how I just throw them in my fridge on a sheet pan and they’re ready to go for when we get home from work. Because after a full day of cooking, the last thing we want to do is cook some more! 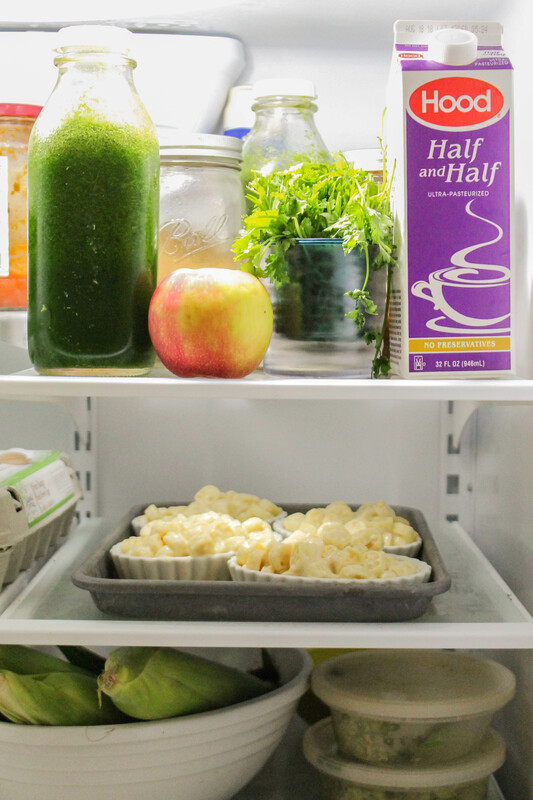 Here’s how I prep for quick dinners – have them ready to go in the fridge! This Quick & Easy Macaroni + Cheese is the most delicious macaroni and cheese recipe you've ever tasted! In a large sauce pan, start a roux by melting butter and whisking in the flour over low heat. Cook this for about 4-5 minutes. Turn the heat up to medium and add all the half and half, whisking quickly to incorporate the roux. Let simmer over medium low for five more minutes and then add all the cheeses. Let all the cheeses melt, whisking as they do, and then fold in the cooked pasta, coating everything. In a small bowl, mix the panko and 2 tablespoons of parmesan. Pour the macaroni and cheese mixture into small, oven safe ramekins (this will make about a dozen small servings). For busy nights, get to this step and then save these in the fridge until you are ready to eat. Once ready to serve, sprinkle with panko mixture and bake for 20 minutes until bubbly, and serve alongside a salad. To find more delicious back to school recipes, head over to Hood® Cream website. Remember you can find all Hood® products across New England grocery stores – and if you don’t see it at your local store, ask them to carry it for you! Macaronis are always a quick fix for me whenever I am hunting for something delicious in my kitchen. I love the fact that they are so easy to cook and go with almost any ingredient. But all of my macaroni experiments have cheese as an essential element. It is the one dairy product that I am looking forward to eating. Wonderful recipe. Pinning it to try this in my kitchen. Thank you for sharing.